Futures are right around unchanged this morning as investors await the monthly Non-Farm Payrolls report for January. Despite the lackluster trading in futures, Chinese equities had a very strong night, and there was a ton of economic data released around the world overnight. 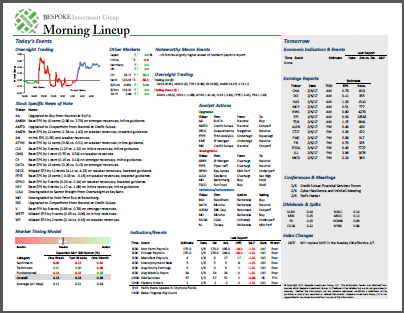 Read all about it in today’s Bespoke Morning Lineup. You don’t need us to tell you that change comes fast in the markets (as well as business in general). The last several weeks are a perfect example, and we don’t even have to go as far back as December to illustrate that. The chart below shows how the S&P 500’s YTD performance stacked up to all other years since 1928 for each trading day so far in 2019. The year started off innocently enough on January 2nd, when the S&P 500 was up slightly, putting the start to the year right in the middle of the pack at 38th place relative to all other years. Things changed quickly, though, after the close on the 2nd when Apple (AAPL) lowered guidance. On January 3rd (the second trading day of the year), the S&P 500 declined 2.5%, putting the YTD loss at 2.35%. That swoon quickly sent the rank of the S&P 500’s YTD change two days into the year at 87th out of 91, or the 5th worst of all time! Equities quickly rebounded from there on the January 4th, sending the YTD ranking back up to 37th out of 91. From there, the YTD performance steadily improved and by the close yesterday, the S&P 500 was off to its 7th best start to a year (after 21 trading days) of all time. Quite a change from four weeks earlier! The point here is that while equities and other asset classes usually do tend to follow trends, those trends can and will change, and when they do it often happens quickly. Therefore, just as it wouldn’t have been a good idea to pack it in and go home and January 3rd thinking it would be a horrible year, now that the S&P 500 is off to its 7th best start to a year in history doesn’t necessarily mean investors can put things on ‘auto-pilot’ from here.